We live in an age of relentless self-promotion. Some people in the workplace remind me of comedian Brian Regan’s sketch entitled I Walked On The Moon (see below). Ever worked with the 'Me Monster?' Whether we realize it or not, we might actually be on the way to becoming one of those 'Me Monsters' as we struggle to stand out in the noise of those who are trying to out do each other. Yet not everyone is trying to out do others. 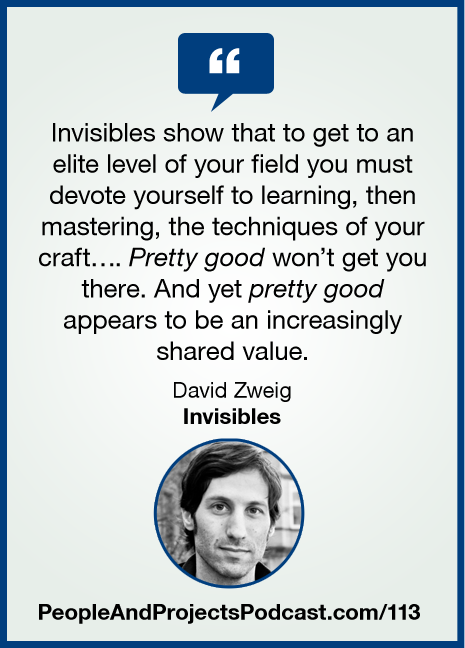 In this episode author David Zweig shares his research into those he calls Invisibles. They love their job. Their satisfaction is in the work itself, not the volume of praise the comes with it. Have you ever felt invisible? That the work you do goes unnoticed? Or at least that there's a lack of appreciation for all that it takes for you to successfully deliver a project? One of the joys of hosting this podcast is finding resources to help you that might not otherwise have come up on your radar screen. I've found David Zweig to be one of those up-and-comers that will inspire us to do our craft better. Enjoy today's discussion with Dave about his book Invisibles: The Power of Anonymous Work in an Age of Relentless Self-Promotion. Learn more about Dave, his book, and his music by visiting http://davidzweig.com/. REPEAT AND FADE by David Zweig is licensed by permission. GOODBYE by David Zweig is licensed by permission.